The party supremo and West Bengal Chief Minister also said that the BJP's strength would drastically reduce in the next Lok Sabha polls. 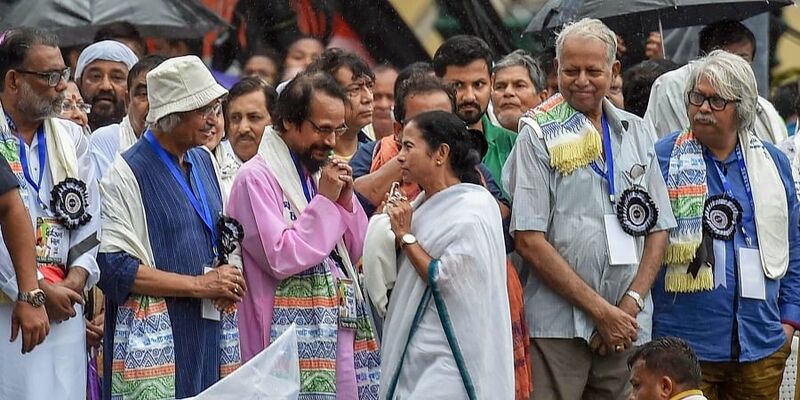 KOLKATA: Claiming that the TMC would win all the 42 Lok Sabha seats in West Bengal in the next general elections, Chief Minister Mamata Banerjee at a rally said the party would oust the BJP to save the country. She said the BJP's strength would drastically reduce in the next Lok Sabha polls. "We will win all the 42 Lok Sabha seats in the state. It is our pledge. We will oust the BJP to save the country. We will organise a big rally here in January and invite all the (opposition) leaders," she said at the TMC's annual Martyrs' Day rally here. Banerjee, who mooted the idea of a federal front to defeat the BJP, said, "We don't bother about the chair. We only bother about the people and the country." Taking a dig at the saffron party for the collapse of a makeshift tent at PM Narendra Modi's rally at Midnapore, she said, "They cannot build a pandal. How can they build the country?". "During the no-confidence vote in the Lok Sabha yesterday, they (NDA) got 325 votes, but in the 2019 Lok Sabha election, their strength will come down to barely 100 seats," she said.